The Lightbox>Materials button will launch Lightbox with the Materials tab showing, so you can select a material from disk. 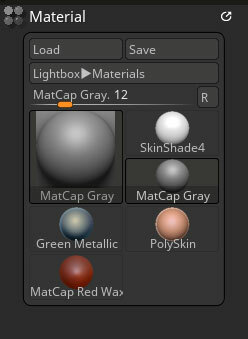 To show in Lightbox, materials should be saved to the ZBrushCore/ZMaterials folder. Click a small Material thumbnail to select that material. Recently used material will be displayed here.